Like any deep but constantly demanding passion, you have to ask yourself from time to time: is it really worth it? This thought occurred to me this past week as I spotted one of the first Japanese beetles of the season nestled cosily between the wilting petals of my Rose de Rescht. I’ve had a tumultuous relationship with this particular rose bush for almost thirteen years. Compact and well-formed, the Rose de Rescht has an upright, soldierly posture —and an intriguingly shady past. Roses are garden royalty, their ancestry a matter of careful if not obsessive record, but no one is entirely sure about the Rose de Rescht’s family tree. According to Anny Jacob in Roses Anciennes et Roses Sauvages, there is some evidence that it actually originated in Iran. This mysterious stranger was spotted in 1880 in England, popped up briefly in 1890 in Germany, and then unaccountably disappeared until the 1940s when it resurfaced again in England. I was first introduced to the Rose de Rescht by Nina Newington during a lecture at the Berkshire Botanical Garden many years ago. It was one of the twenty or so roses she recommended for growing in the RI region and, at her suggestion, I purchased a bare root plant through the excellent Pickering Nurseries http://www.pickeringnurseries.com/ in Ontario. 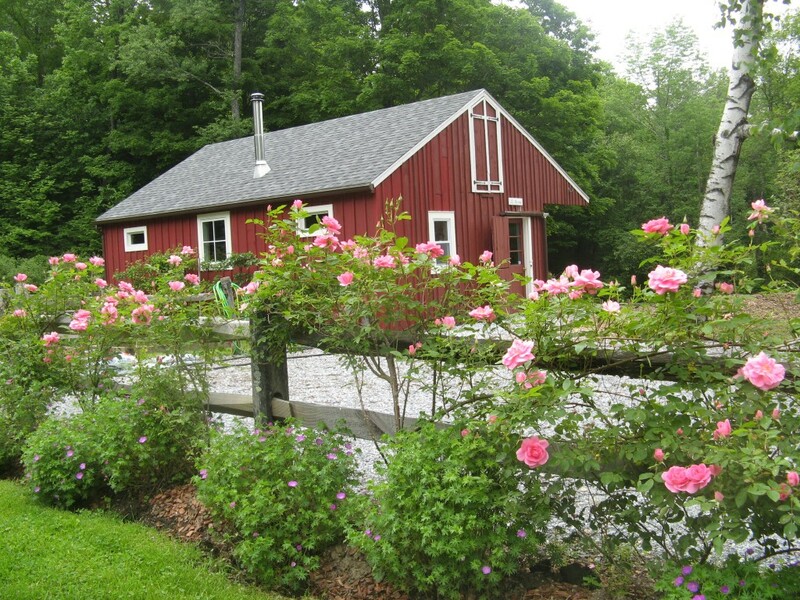 Roses are best planted in late November, allowing them to settle into their surroundings in a dormant state. This is before the ground— though not necessarily ones fingers and toes — goes into a hard freeze. I will never forget the numbness stealing over my body as — working through an early snow storm — I dutifully soaked my skinny, naked Rose de Resch in its recommended manure tea bath and then tucked it into its well-composted bed which I’d carefully amended with rock phosphate and green sand. Because of its dubious lineage, no one is quite certain how to classify the Rose de Rescht, but it most closely resembles a Portland Damask which probably makes it a member of one of the great storied rose families, along with Gallica, Alba, and Centifolia. Like many blue bloods, these highly cultivated roses can be demanding and tempermental. They like constant attention: richly composted soil, judicious and personalized pruning, lots of water, deadheading, staking on occasion, garlic extract spray to ward off pests, and on and on. I ended up waiting on my Rose de Rescht hand and foot, worrying that I wasn’t feeding it enough organic matter, examining the foliage for black spot and spider mites, wondering if it was getting sufficient sun, or maybe too much sun. I displayed all the hallmarks of a moonstruck, uncertain admirer in the thrall of a withholding and entitled lover. And then one day in late June my Rose de Rescht flowered. A hundred or so petals rippled open overnight and filled the morning air with a heady come-hither damask fragrance so intense I nearly swooned. Gertrude Stein could not have been a rosarian! This rose was not just a rose. It was a perfectly coiffed narcissist, lolling back against its deep green pillows of foilage. For seven or eight days in late June and early July it held me in its spell. That deep fushia and crimson color! The sweet, musky fragrance! It ended, as these things will, suddenly and without warning. 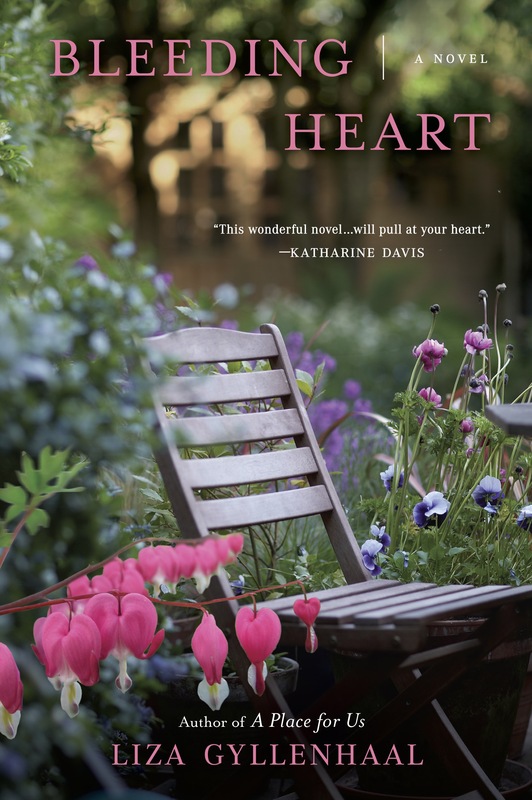 One morning I woke to find its petals strewn all over the garden bed. It was gone. And I was left with a sense of emptiness and frustration. All that time and devotion wasted on such a heartless dandy! You would have thought that I’d learned my lesson after that. You would have hoped that I’d moved on. But, truth is, I put nearly a dozen more years into that dysfunctional relationship. I’d give, give, give and the Rose de Rescht would take, take, take and then keep me faithful with that annual but all-too-brief display of affection. Well, it’s over now. Two years ago on a blustery November afternoon I dug it up and moved it out of the rose bed and down by our white wooden entry gate. I don’t really see it there. 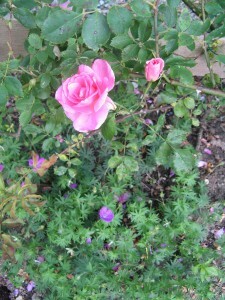 It blends in with the small group of rose varieties that, like the Rose de Rescht, tend to blossom only once a summer. My rose garden is now primarily composed of reliable, hardy Prairie Princess shrubs that flower almost continuously from mid-June through late September. They’re nothing special, but I can count on them and they don’t need much in the way of special treatment. Though, it’s true that they don’t make my heart race either. Not the way the Rose de Rescht did. When I saw it the other day — a beloved face glimpsed unexpectedly in a crowd — I felt a pang of sadness and reget. I was gripped by the urge to pick the Japanese beetle off its wilting bloom. To deadhead its spent flowers. But I knew how one thing would lead to another. It wasn’t easy, but I walked on. They’re big eaters! Roses have insatiable appetites, especially for heavy, compost-rich diets. I feed mine well-seasoned manure that I buy from a dairy farmer friend. And they like their snacks: I amend the rose beds monthly during the growing season with Rose-tone and green sand (I find every rose-grower has his or her own favorite snack food), but stop after the beginning of August to keep the bushes from sending up new shoots too late in the game. They get thirsty fast— so be sure to water, water, water! Everything in my garden is so parched now that it’s tough to decide who gets to drink first. I find that my roses can withstand the high temperatures, but their production will start to fall off without sufficient watering. Make a truce with the Japanese beetles. Forget the bags, more often than not they just attract more beetles and they’re an eyesore in the garden. By the time the beetles arrive, the first big blooming period is usually winding down, so I deadhead as many flowers as possible. This discourages the beetles from hunkering down — and promotes the next round of blooming. I shake what beetles remain off the plants and into a jug of water laced with vinegar. Make a study of them: As mentioned, I took a wonderful starter course on roses at the Berkshire Botanical Garden years ago which laid a great foundation for understanding these extraordinary plants. I’ve also collected many books on the subject including the indispensable Tender Roses for Tough Climates by Douglas Green, a terrific primer for the beginner rosarian.